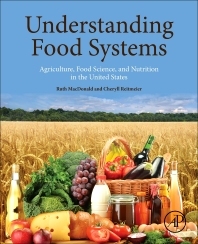 Understanding Food Systems: Agriculture, Food Science, and Nutrition in the United States explores the complex and evolving system from which the United States gets its food. From farm, to home, and everything in-between, the authors use a scientific perspective that explains the fundamentals of agricultural production, food science, and human nutrition that will guide readers through the issues that shape our food system, including political, societal, environmental, economic, and ethical concerns. Presenting the role and impact of technology, from production to processing and safety, to cultural and consumer behavior perspectives, the book also explores the link between food systems and the history of nutrients and diet patterns, and how these influence disease occurrence. Current topics of concern and debate, including the correlations between food systems and diet-related diseases, such as obesity and diabetes are explored, as are the history and current status of food insecurity and accessibility. Throughout the text, readers are exposed to current topics that play important roles in personal food choices and how they influence components of the food system. Dr. Ruth MacDonald is Professor and Chair, Department of Food Science and Human Nutrition, at Iowa State University, and the Assistant Dean for Graduate Programs for the College of Agriculture and Life Sciences. She holds a PhD in Nutrition, minor in Food Science, and Masters in Nutrition, minor in Physiology from the University of Minnesota, and she is a Registered Dietitian. Following her PhD she was a Post-Doctoral Fellow at Harvard Medical School, Joslin Diabetes Center for 2 years. Dr. MacDonald was on the faculty at the University of Missouri for 17 years, rising through the ranks from Assistant to Full Professor, prior to relocating to ISU. Her research interests include the role of dietary factors in cancer progression, specifically breast, colon and prostate cancer. Using mouse and cell culture models, she explored the ability of selected dietary botanical supplements and phytoestrogens to alter cancer cell development and characterized their cellular mode of action. She identified a role for estrogen receptors in colon cancer risk. This work was funded in part by the NIH-sponsored University of Missouri Botanical Center, USDA and AICR. In other work funded by the USDA, she studied the cellular role of zinc in regulation of growth and food intake. While at the University of Missouri, she taught courses in nutritional biochemistry, sports nutrition and food science. At ISU she teaches a graduate course in nutritional oncology and an undergraduate course in food systems. She developed service learning curricula for undergraduate nutrition and dietetic students funded by the Lance Armstrong Foundation and the American Cancer Society. With funding from the USDA she leads the Cyclone Scholars program that provides tuition scholarships to underrepresented minority students. Dr. MacDonald gives frequent public presentations on the science and safety of biotechnology use in food and is a scientific expert for GMO Answers and Best Food Facts. Dr. MacDonald is a 2014 graduate of the Food Systems Leadership Institute. She is a professional member of the Institute of Food Technologists (IFT), the American Society for Nutrition (ASN), and the American Association for Cancer Research. Dr. MacDonald has served on editorial boards for the Journal of Nutrition, Journal of Nutritional Biochemistry, Nutrition Research and Korean Journal of Nutrition. She has been a member of the Executive Board for the Nutrition Division of IFT and currently serves on the IFT Higher Education Review Board. She has served on grant review panels for the NIH, USDA, Department of Defense, and Komen Foundation. She also served on the state of Iowa Economic Development Board and the Technology and Commercialization Committee. Dr. MacDonald has traveled extensively and is a faculty leader for the Dean’s Leadership Program in Rome that engages ISU students with researchers at the United Nations Food and Agriculture Organization. Although she was raised in central New Jersey, Dr. MacDonald has adopted the Midwest as her home. Her husband is a native Minnesotan and their two sons were born in Missouri. Dr. Cheryll Reitmeier is Professor Emeritus, Department of Food Science and Human Nutrition, Iowa State University, Ames, IA and currently resides in Detroit Lakes, MN. Prior to retirement in 2013, she was Professor and Associate Chair. As Associate Chair, she provided leadership for the undergraduate teaching program for students in dietetics, nutritional science, food science and culinary science and supervision of the undergraduate curricula. She joined the Food and Nutrition Department as a lecturer in 1982 and taught courses in food preparation, experimental foods, food ingredient interactions and formulations as well as introductory and senior seminars. In collaboration with other educators, she developed a course about food for space travel, a study abroad course about ecological and food systems interactions in Costa Rica, an introductory course about grape and wine science and a graduate course in the sensory evaluation of wine. She and Dr. MacDonald created a course about the U.S. food system and taught it together for 3 semesters. Dr. Reitmeier was actively involved in projects related to the scholarship of teaching, including incorporation of communication into science courses, student self-assessment strategies, electronic portfolio use, and development of cooperative learning activities. As the Education Mission Specialist for the NASA Food Technology Commercial Space Center from 2000-2005, she developed educational materials and conducted outreach programs about food science applications for space. Dr. Reitmeier’s research involved characterizing the quality, safety and sensory attributes of soy foods, fruits, apple cider and wine. She was an Associate Editor for the Journal of Food Science Education, served as a member of the IFT Higher Education Review Board and is a member of the Institute of Food Technologists. Prior to her employment at Iowa State, she worked as an Extension Food and Nutrition Specialist for the University of Missouri, Mountain Grove, MO. She also worked at the Red River Valley Potato Research Laboratory, East Grand Forks, MN and American Crystal Sugar Company, Crookston, MN. Dr. Reitmeier earned a B.S. degree from the University of Minnesota in Horticulture in 1973, a M.S. degree in Food Science from the University of Arkansas in 1975, and a Ph.D. in Food Science from Iowa State University in 1988. She grew up on a wheat and sugar beet farm near Crookston, MN.